is amy better with sonic 또는 shadow? which hot Amy pic looks better 2 you?! The fans pick: im a girl! 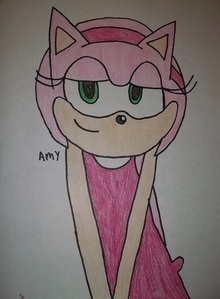 Do 당신 like Amy Exe? Can 당신 업로드 a picture to your camera roll? Amy Was Taking A Walk To A Tree. (Where I Was.) In Her New Outfit To Talk To Me Then She Suddenly Saw Sonic. ''Sonic!'' Amy Said. Sonic Just Ran, Away Then She Started Running After Him Until Sonic Saw Me Sleeping Under The Tree, He Woke Me Up. ''What The...?'' I Said. Until I Saw Sonic, Sonic Grabbed Me Then Pulled Me To Silver. ''Silver!'' Sonic Said, Until I Headed 집 To My House. ''Jeez....'' I Went In Then Jumped Onto The Couch. Then The Door 벨 Rang ''Hello? Kayla? It was Fourth of July. Fireworks, cheering rants, parades, the colors, and of course, The Cutest Hedgie Contest. I couldn’t decide if this was really a rant 또는 not, but whatever. Amy Rose has become a problem to me, but it’s a very schizophrenic problem. In some games I like her, in others I don’t. I will be speaking my opinions about game, Comic, and TV show Amy’s throughout the ages here, as each one is different. On the 일 in Planet Mobius Sonic is going on the 날짜 with Amy. When the evening comes Sonic have to get the romantic rose for Amy and Sonic was ready for the 날짜 with Amy. 20 min. later Sonic was coming to pick up Amy from her house and go to the restaurant in Station Square. 1 시간 later Sonic went back 집 from Station and take Amy 집 and give her a 키스 and say "Good night, Amy and I 사랑 당신 soo much." In the morning, Sonic was saying Good Morning to Amy and they went to the 식당 for breakfast and 1 시간 and 30 min. later they went back 집 and have fun. Amy and her 프렌즈 were sitting down at her house talking about robotnik until...."Hey 당신 guys.what do 당신 think its like having a little sister 당신 know for once?" y is sonamy such a likeable couple?